What is the deal with my hairline? When it comes to our physical appearance, I guess we all have those niggly things that in the grand scheme of things don't really matter, however, if we were to return to this Earth again as ourselves, we'd probably choose to not bring them with us! Maybe it's a slightly crooked front tooth? Or a bump on the bridge of your nose? For me, it's my widow's peak - which I know, is hardly the worst thing in the world, but man it is annoying! For anyone who doesn't know, a widow's peak (AWFUL NAME!) is a triangular tuft of hair that sticks out, right in the middle of your fod and no matter what you do, it will never sit nice and uniform with the rest of your hairline. For years, I attempted to shave it off (lol), I trimmed it down to nothing, I tried to bleach it (omfg) but each and every time my widow's peak came back with a vengeance. Worst of all was that I was out on my own with this one, nobody else that I knew seemed to have one! 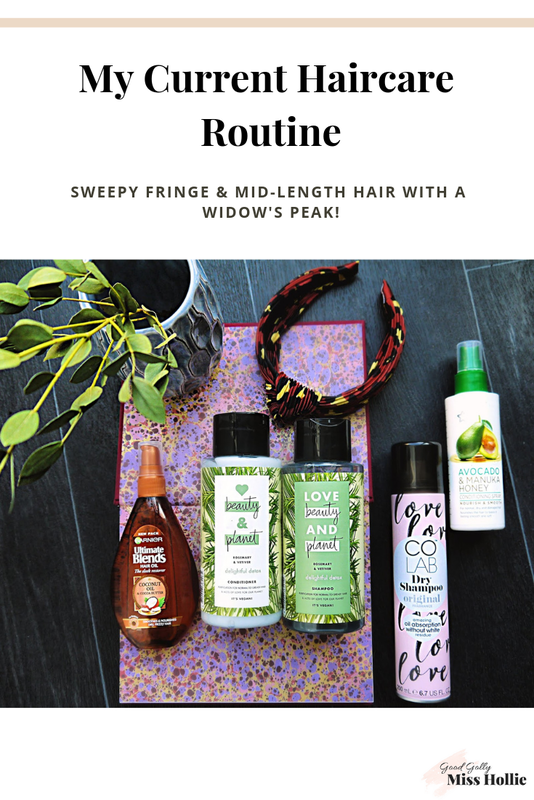 Not all is lost though as I've since learned that total babes Blake Lively and Kourtney Kardashian both have a Widow's peak and this Bustle article on '7 things people with a widow's peak will understand' made me feel less alone in this peaky world. Anyway, to the point of this blog post. 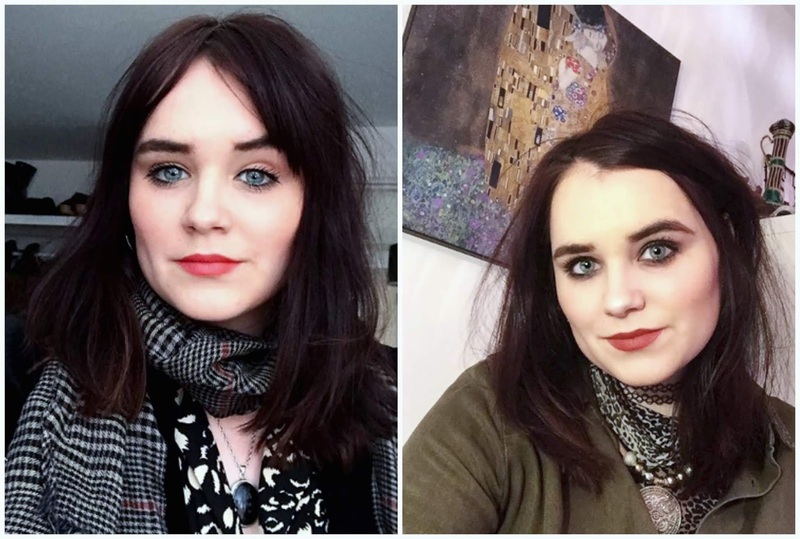 I recently went to see my hairdresser and asked for a sweepy parted fringe to try and do something to make my widows peak less obvious. And with a new haircut, came a new everyday hair care routine which I'm going to share with you today. 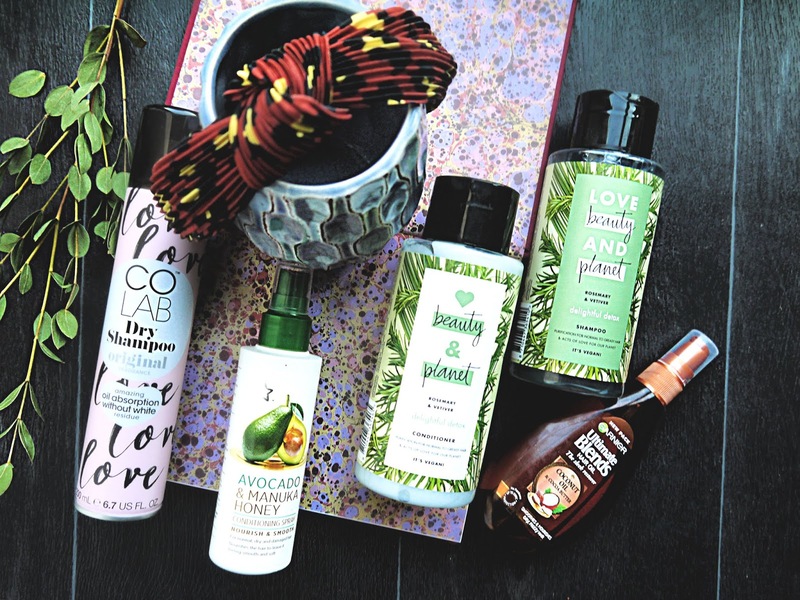 I bought all of these hair care products in my local drugstore's, Boots and Superdrug. I've found this routine to be the one that works for me best at the moment. My hair is naturally very straight and it is fine, but I have lots of hair to compensate for it. I struggle with achieving volume and it doesn't hold a curl *sob*. My hair is currently coloured mahogany brown/red using this eSalon formula. Clear, gel-like formulas that are intended to cut through product build-up and grease are the kinds of shampoos that work best for my hair. As my hair is super straight and lacking volume, creamy/yogurty shampoos (think Head And Shoulders) just don't work for me. 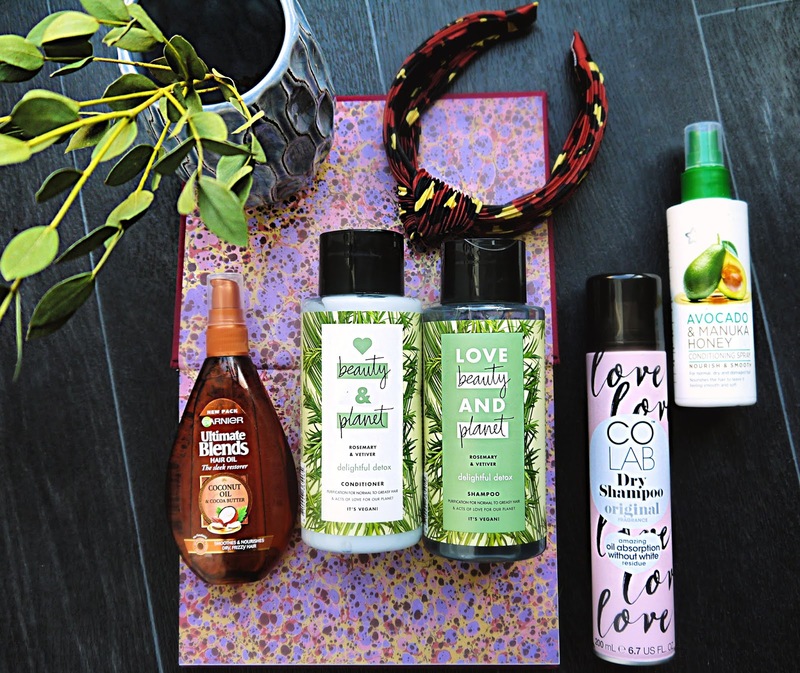 I am also trying to be more conscious of the beauty products I'm buying (see my cruelty free makeup routine) and so with all of this in mind, I was hugely tempted by the Love Beauty and Planet Delightful Detox Vegan Shampoo and matching conditioner. 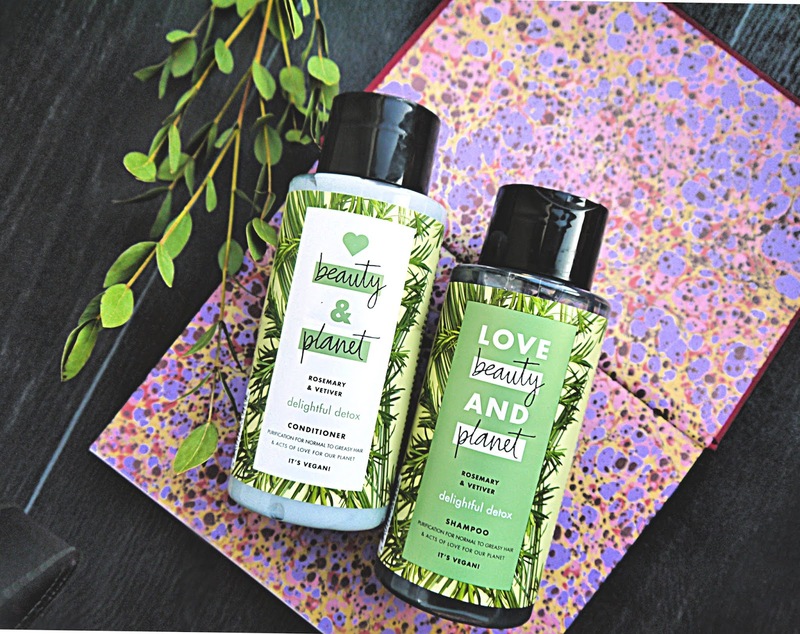 This Rosemary and Vetiver scented shampoo and conditioner set smell so GOOD, especially if, like me, you are drawn to herbally, botanical scents. So far, they've been working really well for me, though I am mindful the shampoo does contain sulphates. Boo. After I've washed my hair, I prefer to just let it air dry, however, now that I have a fringe cut in, I need to quickly blast it with the hairdryer to ensure it dries the way I want it to. When my hair is 60% dry, I'll give the ends a spritz of the Superdrug Avocado And Manuka Honey Conditioning Spray which I use to help my parched / bleach damaged ends look less frizzy. - It also smells pretty gorgeous too and instantly transports me on holiday with every spray. 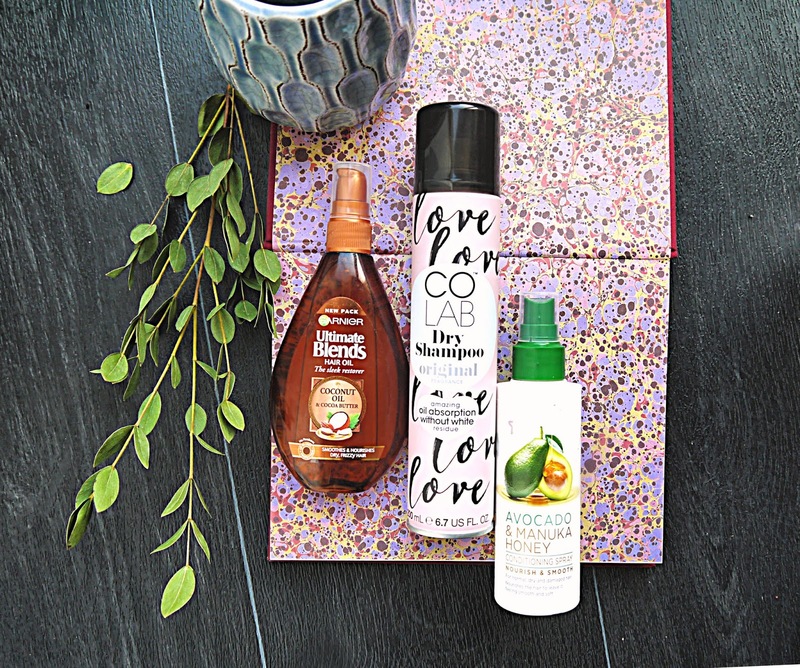 Using an oil may seem counterproductive to everything I've said about my hair needing to NOT be weighed down, however, the Garnier Ultimate Blends Coconut Oil really can be a treat for the ends of your hair if they aren't in brilliant condition. I apply the oil very sparingly to the ends before using my hair dryer, as it protects against 230C heat. And from a different point of view, it also comes in handy to tackle the old aforementioned widow's peak! I'm still on the fence about the Colab Original Dry Shampoo. Why? Well, I don't think it's as good as the beauty blogger hype has made out over the years. The packaging says that the formulation doesn't leave a white residue... but no matter what I do, whether it be shaking the can vigorously or alternating how close I hold the can to my head...it leaves a bright chalky white residue. It smells nice (apparently is bergamot and rose) and seems to do the job, but I'm not sure I'd be in a hurry to replace it once it's finished. Any recommendations?